The G2 RIP Ammunition in .45 ACP is solid copper. 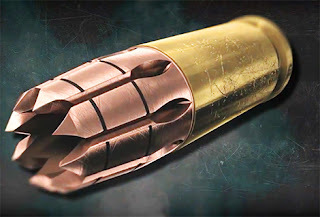 It creates a significant wound cavity with several wound channels as the bullet fragments within the target. Based on what I've been told, they don't do as well on auto windshields, etc. 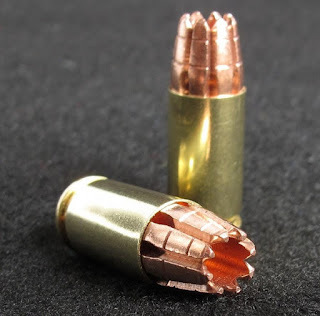 as extreme penetration ammo, but that's not what they're for. They are designed to damage flesh and bone, not to punch through walls to damage people beyond. For your Christmas entertainment, first a combined British Army Band flash mob. It will remind LSP of his days under the standard in the Royal Army, wearing his red coat and his helmet with a spike on top. Jules walks through the mall in England and this is what she hears at Christmas time. No big deal for her. The Smithsonian Air and Space Museum is some place that I can spend an entire day in and just not get enough. The US Air Force Band and Singing Sergeants did a flash mob there (originally posted on this blog) in 2013. This is a reprise of that for those of you who are skimming the net today on Christmas, the most auspicious of days.